A zookeeper holds Jumoke's hand. Concussions, ACL tears, and knee cartilage damage are among the common injuries the UW Medicine sports medicine and head physician of University of Washington’s football team diagnoses and treats. Over the weekend, Dr. Kimberly Harmon brought her sports medicine expertise to help diagnose an injured gorilla at Woodland Park Zoo. 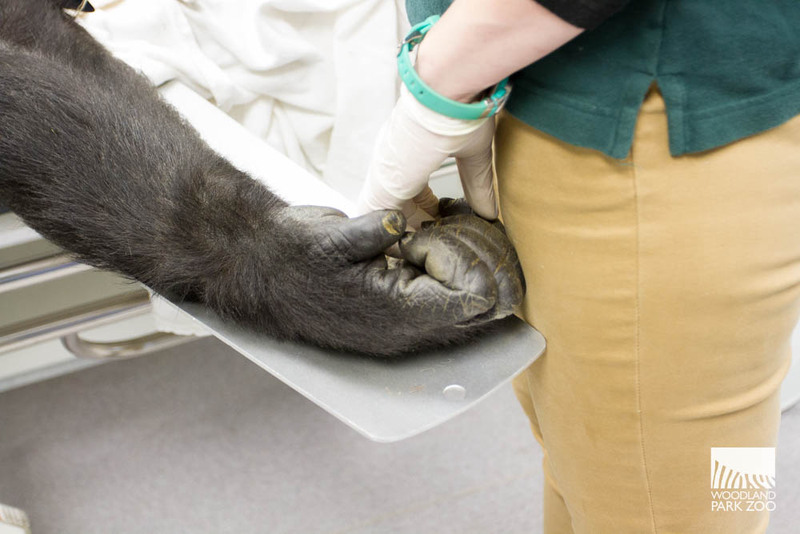 The zoo called in Harmon and other human and animal medical specialists for a diagnostic examination on Jumoke, a 32-year-old, female gorilla who was born and raised at the zoo. The 275-pound western lowland gorilla sustained leg wounds during a scuffle off exhibit in the sleeping dens with a young female gorilla in her group named Uzumma. 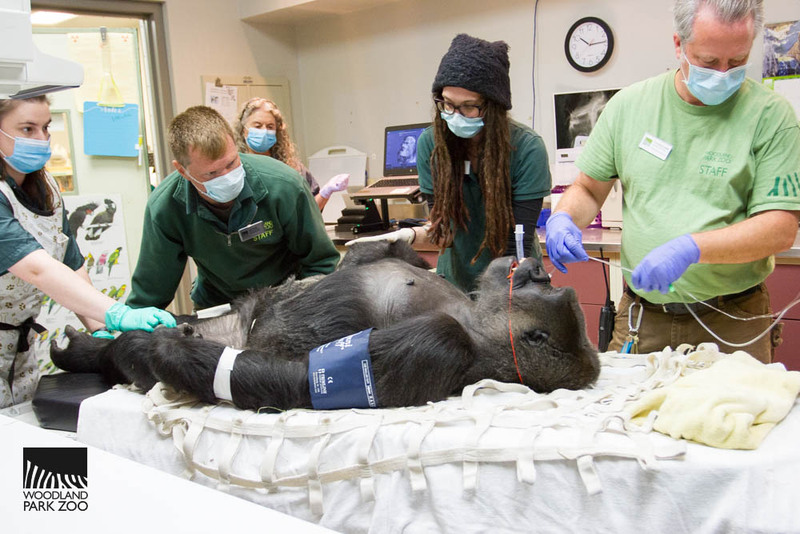 Woodland Park Zoo's animal care staff prepare Jumoke for her exam. Martin Ramirez, Woodland Park Zoo’s mammal curator, said gorillas are generally calm animals, but scuffles are not uncommon, especially younger gorillas challenging older gorillas. “Uzumma, who turns 10 years old this week, initiated the interaction with Jumoke. It was a display of natural adolescent behavior like a human teenager acting out,” said Ramirez. Jumoke was examined at the zoo’s veterinary hospital. Radiographs diagnosed a fracture of the tibia, one of two bones in the lower leg. Harmon was joined by Dr. Albert Gee, a sports orthopedic surgeon at UW Medicine, and Dr. Alex Aguila from the Animal Surgical Clinic of Seattle. The bone fracture is already showing signs of healing; no surgical fracture repair will be attempted at this time. The patient will receive antibiotic and pain medications, and have limited activity. 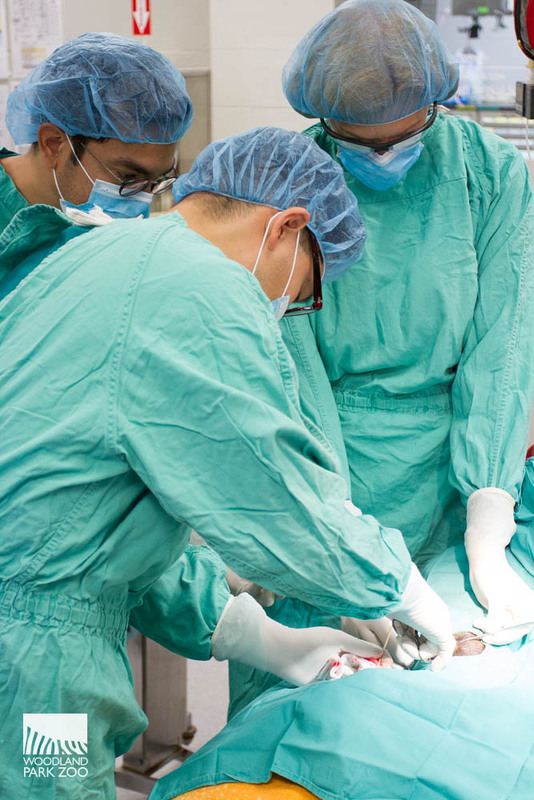 “This type of fracture in a human is typical of a blunt force impact and should heal if a bone infection does not complicate the healing,” said Dr. Kimberly Harmon. Jumoke also will undergo physical rehabilitation therapy to help her fully recover from her injury. Non-weight bearing exercises that maintain the normal range of motion of the leg joints will return her to normal function. Drs. Aguila, Gee, and Harmon. 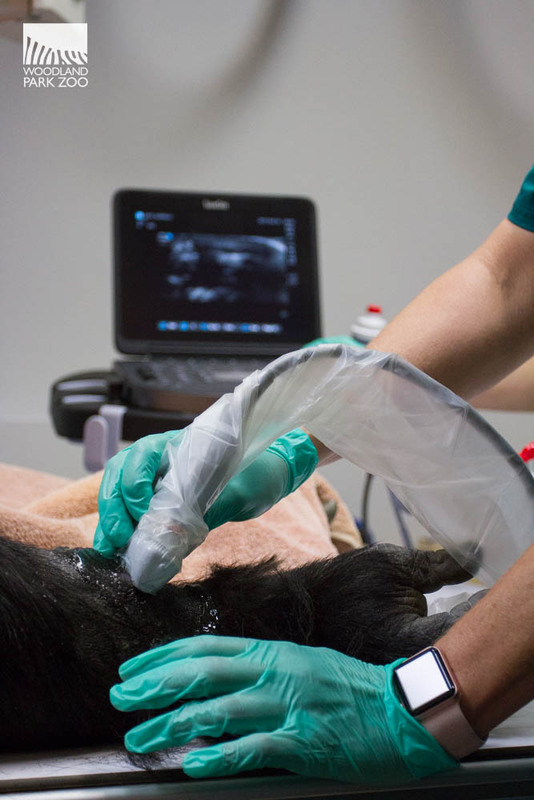 As a part of the zoo’s animal health program, physical rehab is used to alleviate pain from an injury or surgery; to improve circulation or range of motion and coordination; and to enhance an animal’s quality of life, explained Collins. “The techniques of physical rehabilitation are non-invasive. 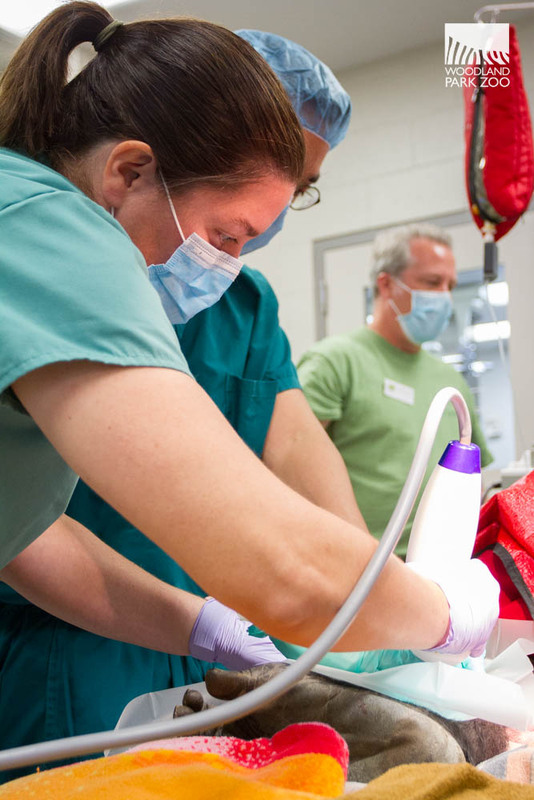 Used in conjunction with traditional veterinary medicine, physical rehab provides additional medical care options to improve the recovery of patients with both chronic and acute conditions,” said Collins. Dr. Leslie Eide using the shockwave therapy unit. Harmon is a UW Medicine physician specializing in sports medicine, family medicine and orthopedic health. Also joining Harmon and the zoo’s veterinary team for the exam was Dr. Leslie Eide with Animal Surgical Clinic of Seattle, who is certified in canine rehabilitation with a focus in sports medicine. “We take care of more than 1,000 animals at the zoo. To ensure we provide top-notch care to each animal, we consult with experts throughout the country when it’s necessary. Locally, we rely on a network of volunteer medical specialists to consult and perform exams, procedures and surgeries. We are so grateful to this network and especially to Harmon, Eide and the other specialists who donated their time and expertise to help our injured gorilla,” said Collins. Earn Your Master’s degree the wild way!